Dyana Villas is located in the center of Seminyak, offers 1 to 5 bedrooms are conveniently surrounded by cafes, night clubs, shopping and dining options. It provides homely and private villas with outdoor private pools, patios and well-equipped kitchens. It is only 800 meters from Seminyak Beach and 20 minutes to the famous Kuta area. It takes 25 minutes by car from Ngurah Rai Airport to the villas. Each villa is fitted with furnishings and terracotta. All villas have open private dining rooms, large seating areas and a semi open bathroom. 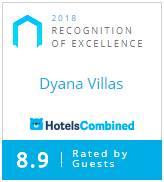 Our hospitality at Dyana Villas is warm and welcoming you in a way that is uniquely Balinese. OUR OFFICIAL WEBSITE - showcase exclusive rate, fabulous benefits and unique offers that you won't find anywhere else. NO HIDDEN CHARGES - all rates, package and promotions should always include applicable taxes and service charges. We guarantee that you will get the best available rate when you book on our official website. If you do find any lower rate within 24 hours of making your reservation, we will be very happy to match them and we will also give you an additional 10% disc directly. Mason Adventures Bali (also known as Bali Adventure Tours) is the island’s critically acclaimed and longest-established (est.1989) adventure tour operator. All of our products feature unrivaled, world class interactions, facilities and services to bring you Bali’s only complete ‘5-Star’ adventure experiences. We’re a family run business that owns and operates all of our tours and services, including our very own fleet of GPS-controlled buses that ties it all together. All tour guests are also covered by our exclusive free Helicopter Medivac Service in the case of any serious emergency. Our friendly and professional staff are the best in the industry, and as Bali’s safest, most efficient and eco-friendly adventure company, you can count on us to provide you with an unforgettable experience. Our full range of tours include: The Mason Elephant Park & Lodge in Taro, Jungle Buggies, White Water Rafting, River Kayaking, Mountain Cycling, Tropical Trekking, and Helicopter Sky Tours.